Is it possible to establish a genealogy of the armed actors that have been roving around eastern Congo over the past two decades? The first, immediate answer is – no. The spatio-temporal topography and evolution of myriad militias and other groups already appears confusing and complex when looking just at a simple, fixed point in time. Still – and from and analytical point of view – such an exercise yields a certain allure and promises to be a helpful overview tool. Over the past weeks, and thanks to very helpful and useful comments from a range of friends and colleagues (while gaps and errors remain mine alone), a first attempt towards a genealogy or timetable – since the word genealogy like so many others has also been captured and loaded – was growing. Starting from 1995 roughly, it covers precisely two decades of cyclical conflicts and focuses on the North Kivu, South Kivu, and Orientale’s Ituri district. The table as such is incomplete, so to say a ‘beta version’ that can be refined and reworked in subsequent efforts. For instance, it lacks notable actors. A paradigmatic example is Mayi Mayi Simba. Included in some other of the ‘classic’ Mayi Mayi (e.g. Dunia, Alunda, etc. ), it was impossible to locate Mayi Mayi Simba given it a) existed in various times b) in various configurations c) as umbrella for various groups d) simultaneously as various groups e) across very different areas. Looking at the below depicted table it becomes clear that such a phenomenon is not graspable through a humble two-dimensional drawing. Similar, the characteristics of Raia Mutomboki for instance, are only partially described. Coming up with such a contribution usually faces two possible destinies: Either it is incomplete and contains errors or it gets never finished. The aim of this genealogy (unlike the mapping which is much more work in progress) is merely to have a first draft as a starting point that can turn into a living memory with potential refurbishment over time. Constructing this timetable has been hampered by a few circumstantial challenges. First of all, my own sources do not go back beyond 2008 which is when I actively engaged in tracing and understanding developments in the region. Secondly, the usually single best publicly available general source, the UN Group of Experts’ reports, did not focus on smaller actors a lot before 2008 and after 2012. Thirdly, the quest for additional sources becomes more tiresome the more specific and nitty-gritty it gets (not so surprising…). Fourthly, many sources contradict each other and it is difficult to collect a minimum sufficient number to claim something on comparatively stable basis – yet, the beta character of this table also blurs details for purely (typo-)graphic reasons. Last but not least, the simplistic design shall be self-explaining. The name of a group stand roughly at its creation, the permanent horizontal arrows indicate the survival/development of the group up to directly succeeding groups in some cases, the dashed arrows link to indirectly succeeding groups. Non-horizontal arrows indicate splits, renegades, partially succeeding groups. Needless to say, the seeming onset of many groups in 1995 is due to practical aspects only – these are groups that either emerged that year or at any previous point in time while evolving during the years. 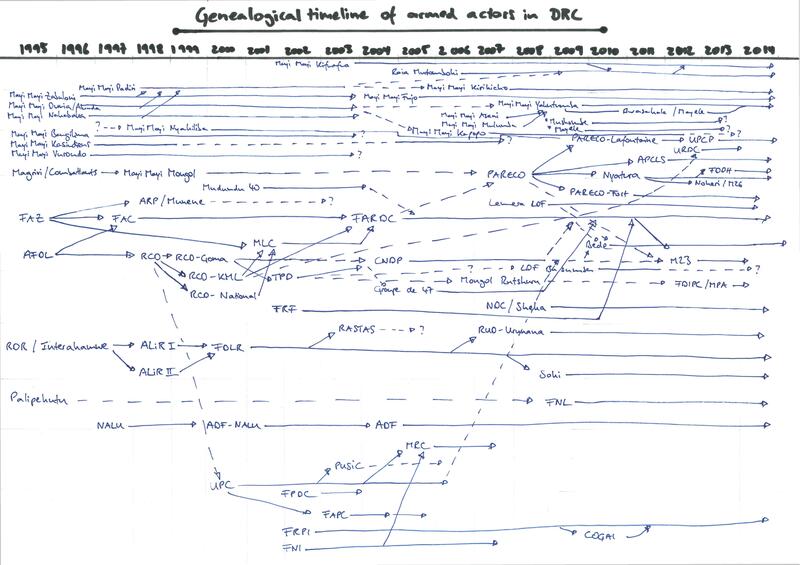 Despite all possibility and probability of gaps and errors, this first attempt of a genealogy still shows a few grand lines: The Ituri part of the Congolese conflicts remains are – comparatively – short and intense phase. While there have been conflicts before 1998 and after 2005, the peak is obvious. This is less clear for the Kivus, where proliferation of groups and intensity of conflict do not align to each other. However, there some crosscutting phases of intense re-shuffling and re-organising. LA GUERRE FINIRA UN JOUR. Thank you for great blog postings. I am Director Africa at the Terrorism, Research and Analysis Consortium and is in the process of updating all DRC profiles. Your postings are central and needless to say you are getting recognition in all profiles. If you have any other references I can use, I really would appreciate it.